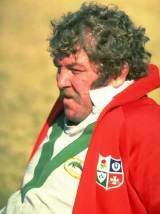 Graham Price, as a member of the Pontypool front-row, is a legend in Welsh rugby and one of the most celebrated props in the world game. Alongside Booby Windsor and Charlie Faulkner he was the bedrock of one of the best Welsh packs of all time and provided the hard graft for JJ, Gerald et al to snare the spoils. Price made his international debut against France at Parc des Princes in 1975, scoring one of the most memorable tries in history in the process. Price hacked the ball on and ran the full length of the field before touching down. In typical style, Price was immediately brought down to earth upon his return to Pontypool, their forwards guru Ray Prosser telling Price: '"Pricey, those French props must have been bloody hopeless if you had the energy for that. It's extra scrummage practice for you tonight. You won't have it that easy again." As much of a legend as Price was in a Wales shirt, his feats with the Lions were also hugely impressive. He started all four Tests on three consecutive tours, in New Zealand in 1977, South Africa in 1980 and New Zealand again in 1983. Price had just missed the boat in terms of the Lions' glory years in 1971 and 1974, his twelve Tests producing not one series win.